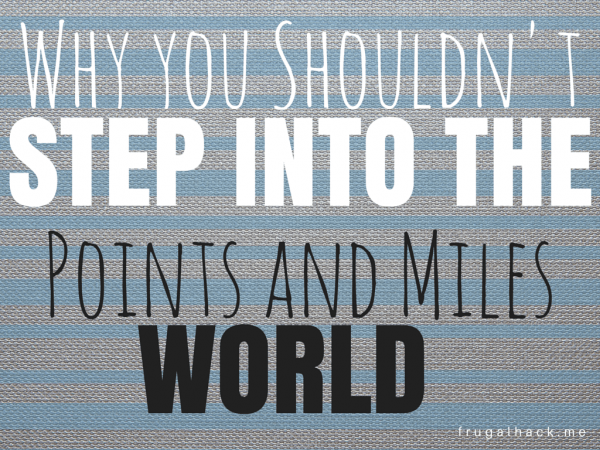 There are many people out there, especially on point/mile related blogs, who will tell you that you need to start earning points and miles! Traveling simply cannot be done without the assistance of this hobby right? Wrong. There are many ways to travel without points and miles and often times it’s much easier to travel that way. Don’t get me wrong, I love points and miles! The opportunities those virtual currencies open up are more amazing than I could ever imagine. That being said, the world of points and miles is a cutthroat one that, for better or worse, isn’t for everyone. If you’re on the edge of whether or not you should jump head first into this hobby, this is the post for you. You don’t have much time on your hands. This hobby, as most hobbies do, requires time… a lot of time. In fact, it’s more than likely that this game will go from hobby to part-time job real quick. If you don’t have extra time on your hands, your ability to keep up with everything in the points and miles world will quickly diminish. Please please please don’t ever carry a balance! In this game, it’s common to spend thousands upon thousands of dollars on multiple credit cards. If, even by mistake, one of those cards start to carry a balance, the benefit of the points and miles you earn will quickly be out weighed by the interest you have to pay. If you currently carry a balance, the points and miles world is not for you. Organization is vital to your success in this hobby. Without it, you run the risk of missing payment due dates, credit card application dates, retention calls, and much more. When there’s money involved, it’s extremely important to stay on top of it. You don’t have a lot of disposable income. This is a game for people with disposable income. It’s not a get rich quick scheme or a “anyone can do it” type of hobby. As the saying goes, “you need money to make money.” And in this hobby, that couldn’t be truer. Without a steady income, it will be very challenging to get approved for different credit cards and the thousands of dollars being spent on your card(s) could raise some red flags. This hobby requires a lot of flexibility. Booking award flights for a reasonable amount of points and miles is tough, but with a decent amount of flexibility (eg. travel sometime in the summer for 1-2 weeks instead of travel from June 21-30), it’s much easier to find what you want. This is a game of “rolling with the punches.” Whether it be rolling with an award chart devaluation or a cashier who all of a sudden won’t let you buy a gift card with your credit card, this is a game that requires adaptation. Not only that, but methods of earning points and miles changes almost daily. That means you’re likely going to need to adjust your earning routine often. Denial is going to happen any way you look at it. Whether it be on a credit card application, a retention call, or in line at Walmart, it will happen and you need to be prepared for it. By that I mean, please don’t be someone who yells at the cashier/representative about how you’ve “done this 100 times and never had an issue.” Just move on and try again at a different store or cashier. The points and miles world is a great one to be apart of for more reasons than one, but to be honest, it’s not for everyone. That’s totally fine, though, because that’s the case for all hobbies. The purpose of this post isn’t to tell you what you should/shouldn’t do, but instead, as a warning of what this hobby entails.